Trii-plex Jettech Systems are Manufacturers of Triplex Plunger Water Pressure Pump with whole systems as per Client requirement of Flow Rate & Pressure for Commercial & Industrial Cleaning, Hydro Testing, Vehicle Washing like Car Wash, Heavy Vehicle, Earth Moving Equipments. These High Pressure Piston Pumps are design with pre set packings & concentric ceramic plungers to provide high pressure up to 250 BAR & Flow Rate up to 15 LPM. The advantages of Triplex High Pressure Piston Pumps in their high efficiency, their ability to generate high pressure and to produce constant volume irrespective of the pressure. Consequently, where an application demands controlled variable flow, they are eminently suited to variable speed drives. Using a Triplex High Pressure Pump with a variable speed drive can provide very high efficiencies, up to 95% depending on the pump type design and how it has been installed, across a wide range of flow rates and pressures. Trii-plex Jettech Systems is the Ahmedabad, Gujarat, India based Manufacturers of a wide range array of Jetting Pump, Plunger Pumps, Test Pumps and Car Wahser Pump ect. We’re the team professionals who understand what customer needs is and trying to full fill those requirements in appropriate span of time with suitable price. We believe in Supply quality products in the best prices. 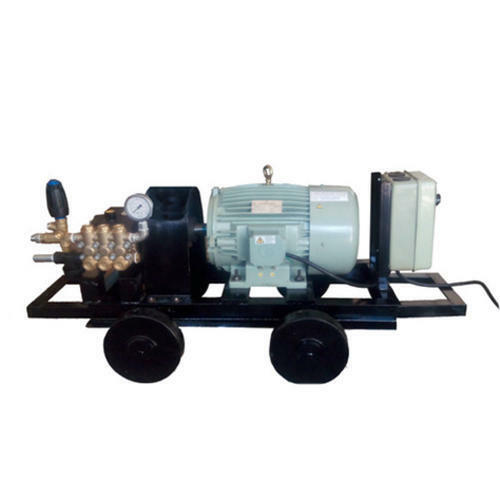 With the aid of reputed vendors of the international market, we have also become a major Importer of HAWK High Pressure Triplex Plunger Pump up to 500 BAR, Trigger Operated Gun (P.A. ), Pressure Regulating Valve, Tank Cleaning Nozzle, Unloader Valve, High Pressure Hose Pipe, Non Return Valve, etc. We Deal in High Pressure Cleaning, High Pressure Hydro Test, Hydro Jetting, Water Blasting, Hydro Demolition, Car Washer, and Industrial Tube & Pipe Cleaning as per the customer’s requirement. Our Customers belongs from different industries like Manufacture Industries, Sugar Plants, Power Plants, Engineering Industry, Automobiles Industry, Petrochemical Industries, Pipe Industries, Railway Industries, Defense, Steel Industries, Cement Industries, Chemical Industries, Cross Country Pipe Lines, Pulp & Paper Industries, etc.